Dentures are a replacement for missing teeth that can be removed and put back into your mouth as you please. Depending on each individual patient case, they may receive full or partial dentures. Full dentures are used when all of the natural teeth are removed from the mouth and replaced with a full set of dentures. There are several types of dentures. 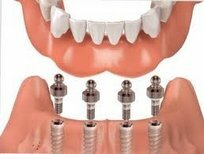 An implant-supported Denture is a type of overdenture that is supported by and attached to implants. A regular denture rests on the gums, and is not supported by implants. An implant-supported denture is used when a person doesn't have any teeth in the jaw, but has enough bone in the jaw to support implants. An implant-supported denture has special attachments that snap onto attachments on the implants.